Type your The Professional Courier tracking number below, get live delivery information with our express tracking system. If you have problem with our express tracking system, please track your package directly on the The Professional Couriers website. If you get no tracking information from The Professional Couriers official website, you’d better contact them. If you have shipped through The Professional Couriers, you will have received a copy of your Waybill. Each waybill has consignment number with three alphabets and 7-10 digits. (eg: BLR12345678). 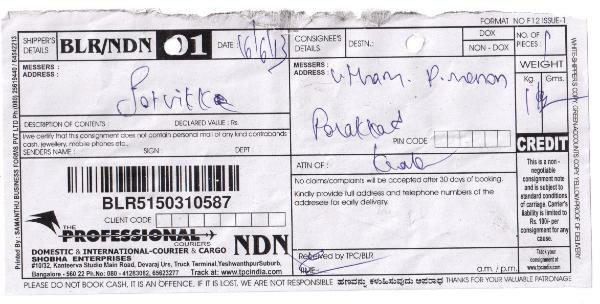 A waybill sample with the professional courier tracking number BLR5150310587. Have no idea about The Professional Couriers? Read The Professional Couriers reviews in advance and write a review after sending your package with The Professional Couriers. Click here to read more FAQ of The Professional Courier. If you have problem with our The Professional Courier Tracking system, submit your problem here, we will help you as soon as possible. Declare: We can NOT contact carrier or others on your behalf, we can only help you track your package with your The Professional Courier tracking number on official tracking system.